Spring is in the air, and around Sevierville, hiking is one of the best ways to get out and explore the beauty of it. To be able to enjoy these nature walks for years to come, it is important to consciously take care of the body that will take you through them. In hiking, one of the most used and abused joints are those in the knee, making knee problems quite common. Here are 7 ways to make sure you are properly caring for your knees while hiking. Your knees and hips are more vulnerable to injury because they bear the weight of most of your body. A force of three to six times your body weight is exerted on your knee with each level step you take. So even being just 20 pounds overweight, or carrying an extra 20 pounds on your backpack adds 60-120 pounds of extra weight on your knees. This is why it’s so important to maintain a healthy body weight, and reduce any unnecessary pack weight for the best knee health. If you experience knee pain fairly often during descents or are sore afterwards, it may be that you need to improve your form or pack weight. Don’t lock your knees when walking down a steep decline. Keep your knees flexed while walking at a steady, slow pace. Increasing your speed tends to lengthen your stride, which in turn intensifies the weight and impact on your knees. Walk in a zig-zag motion, sideways or s-shaped instead of just going straight down hill whenever possible. Wearing the right shoes can make a world of a difference on the comfort your knees experience. Be sure that you are wearing well-cushioned shoes, so that when the heel strikes the ground, the shoe is able to absorb most of the body weight, rather than the knee joint getting all of it. Always wear shoes that fit well. Not wearing the right size can do as much or more damage to your feet than simply walking around barefoot. Try gel inserts if you are looking for a snugger fit, or simply want more support for your arch. Just be sure that your hiking shoes are tied tightly so they fit snug around your feet, which will ultimately reduce the impact of your toes against the front of your shoes. 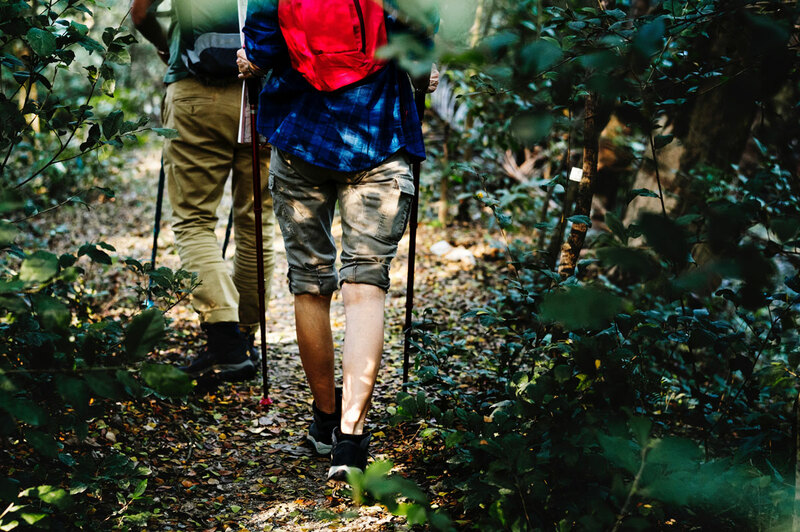 Although hiking in the mountains near Sevierville will certainly help you stay in shape, it is important to always keep your muscles engaged and stretched by being active daily, and regularly stretching. Most injuries people experience are caused by being inactive over long periods of time and jumping into a strenuous activity too suddenly. You are much less likely to experience knee problems if you maintain strong leg muscles to help support the knee. Be sure to perform weighted exercises that work out your hamstrings, inner thighs, quadriceps, and calves. They will help support your weight and reduce the stress placed on your knees while hiking. An easy way to work your legs out is by adding ankle weights to your regular leg exercises, or while walking around in the house. Your diet has a large role in keeping you healthy, and can also help keep your knees in top shape. Omega-3 rich foods, like salmon, walnuts, or olive oil help in keeping your joints lubricated so that you will ultimately experience less friction, grinding and pain. Taking care of your knees during your everyday routines and exercises will one day add up to a lifetime of care, ensuring that you are able to actively enjoy the many wonderful adventures waiting outside for years to come.